The base of the Verizon tower when I looked at the site in early June. In the background: A bowling alley’s roof. Verizon’s cell phone customers in part of South Albany have had to wait a while for better reception, but if the wait is not already over, it should be over soon. 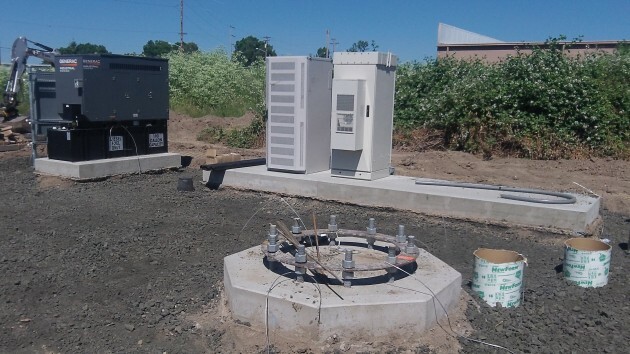 When I looked a couple of weeks ago, construction was well along on the base of what was planned as a 120-foot transmission tower to fill a gap in the company’s cell phone coverage. It was on Oct. 8, 2014, that the Albany City Council approved a conditional use permit for the tower to be built on an undeveloped parcel south of 53rd Avenue, just west of the Lakeshore Lanes bowling center It’s to be a single pole with antennas on top, which drew opposition last fall from people who thought the pole should be disguised to look like a tree. One of them was Councilor Rich Kellum, and he ended up voting no when the council approved the permit, 4-1. The planning commission had previously turned the permit down on the grounds that the tower didn’t fit the neighborhood, but the council had the final say. Verizon maintained that this site was the only one that would work to cover the area that it needed to cover. The tower is “up” as of this a.m….